Samuel Castro for "When in Dining"
Not looking forward to cooking for Christmas Eve? Here's our list of 5-star style Christmas Eve Dinners in Bangkok. 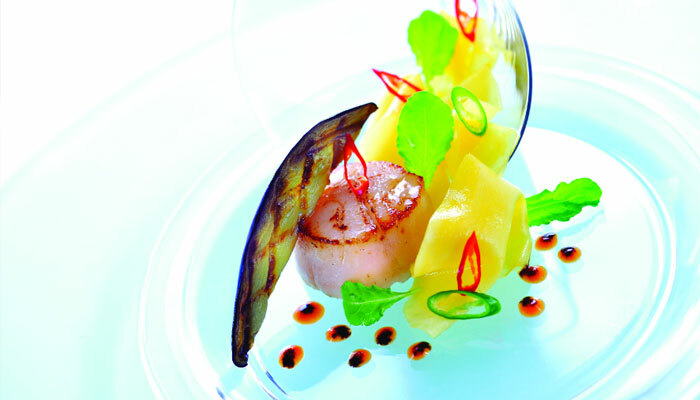 A 5-course dinner that will begin with Chef Jeremy’s playful amuse-bouche of king crab aspic cauliflower espuma followed by a duo of pan-fried foie gras and a red wine terrine served with red berries and ginger bread. Diners will also enjoy a main course of pan-fried Hokkaido scallops with celeriac and a truffle sauce. After palate cleansing Champagne rose granite, the meal will continue with a festive turkey ballotine stuffed with chestnuts, truffle and foie gras, and served with sweet potato and crispy skin. The finale of the evening will be a delicious dessert of chocolate cremeux Earl Grey, citrus crumble, orange segment and ginger bread ice cream. THB 4,500 net per person. Christmas Set Dinner from Spain by Chef Joan Tanya Dot. Enjoy a festive buffet dinner that includes a tempting variety of Western and Asian dishes, Wagyu Beef Carpaccio, Burrata Smoked Caviar, Chilled Seafood, Slow Roasted Duck, Seared Foie Gras with all the traditional Christmas treats to the sounds of a live jazz band and a visit from Santa. La Scala serves up a specially created five-course Christmas dinner menu featuring Hokkaido Scallops, Pumpkin Soup, Boston Lobster Ravioli, Ambassador “Best End of Lamb” and Frozen Panettone “Soufflé” which Chef Maurizio and his team have prepared perfectly to your taste. Taste offers a Christmad Dinner served with violin music from “The Regal Heirs” and popular light tunes from our house band. The spectacular buffet will include pan-seared foie gras with balsamic cherries, grilled lobster with signature sauces served at the table, a festive interactive global sushi and sashimi station a seafood bar with Alaskan king crab legs and more.